These treats taste similar to that well known, addictive chocolate hazelnut spread everyone loves (and that may be off limits if you are lactose intolerant or are on a low-FODMAP diet). This dairy-free snack does not contain lactose, but does provide nutritious fiber and healthy fat from oats, chia seeds, and nuts. Some of the ingredients in this recipe can be high-FODMAP when consumed in larger amounts; to keep it IBS friendly, have just one of these treats at a time. They are best served cold or frozen, so plan ahead. Combine the brown sugar and water in a small saucepan over medium-high heat. Stir periodically just until sugar dissolves; bring to a boil and continue boiling for 1 minute. Reduce heat to low, add the peanut butter and canola oil, and stir until peanut butter melts. Remove from heat and add vanilla. Set aside. Add the chia seeds, hazelnuts, oats, cocoa, sorghum flour, and salt to the bowl of a food processor. Process until the mixture becomes a coarse powder. You may need to stop once or twice to scrape the mixture down the sides of the bowl. Pour in the brown sugar mixture and pulse until the mixture becomes a stiff paste, about 1 minute. 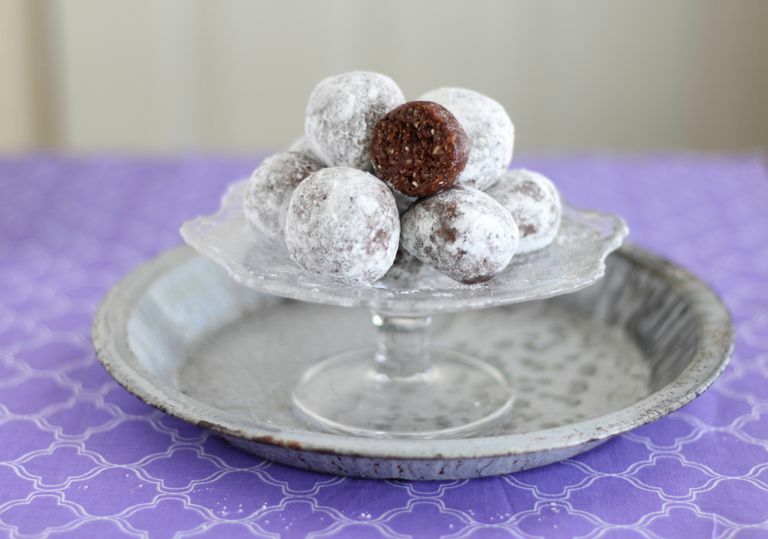 Form batter into a dozen 1-inch balls and place them on a baking sheet lined with waxed paper. Freeze for 1 hour. Immediately before serving, dust with confectioners’ sugar. Store these bites in an airtight container in the freezer or refrigerator. To make this recipe gluten-free, use certified gluten-free oats. Blender directions: Use a medium saucepan for the peanut butter mixture instead of a small saucepan. Grind the chia seeds, hazelnuts, oats, cocoa, sorghum flour, and salt in the blender until the mixture becomes a coarse powder. Add these to the peanut butter mixture and stir until combined. If you are starting with raw, skin-on hazelnuts, simply toast in the oven on a baking tray at 350F for 12 to 15 minutes, stirring twice until they darken a shade or two. Be careful not to let them burn. Then place the hot hazelnuts into a clean kitchen towel and twist the towel to seal them inside. Let them sit for 10 minutes. Keeping the towel closed, rub the nuts together vigorously to scrape the skins off. A little skin may remain, which is fine. Store extra nuts for future use in the refrigerator or freezer.